Steve Jobs reduced the company’s large product lines immediately upon becoming Apple’s interim CEO in 1997. 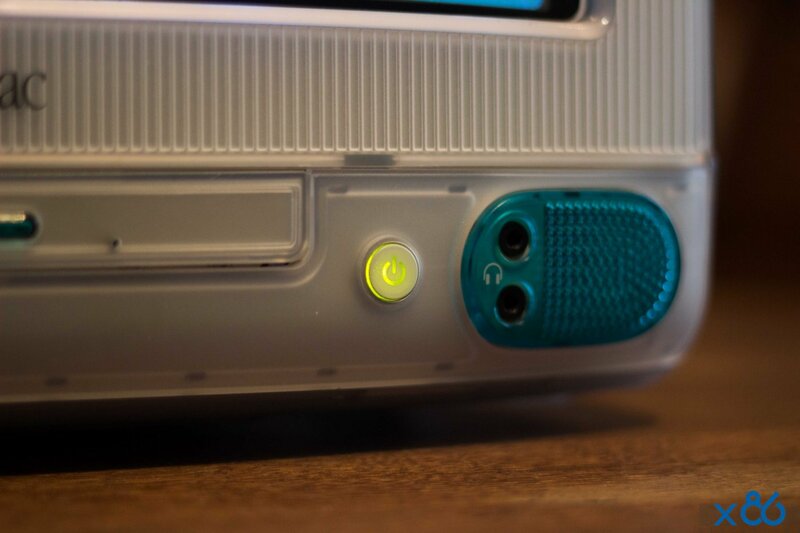 Toward the end of the year, Apple trimmed its line of desktop Macs down to the beige Power Macintosh G3 series, which included the iMac’s immediate predecessor, the Power Macintosh G3 All In One, which featured nearly identical specifications and was sold only to the educational market. Having discontinued the consumer-targeted Performa series, Apple needed a replacement for the Performa’s price point. 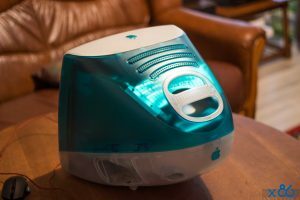 The company announced the iMac on May 6, 1998 and began shipping the iMac G3 on August 15, 1998. 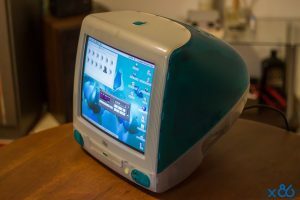 The iMac was dramatically different from any previous mainstream computer. It was made of translucent “Bondi Blue”-colored plastic, and was egg-shaped around a 14-inch (35.5 cm) CRT display. The case included a handle, and the peripheral connectors were hidden behind a door on the right-hand side of the machine. Dual headphone jacks in the front complemented the built-in stereo speakers. Sir Jonathan Ive, currently Chief Design Officer at Apple, is credited with the industrial design. 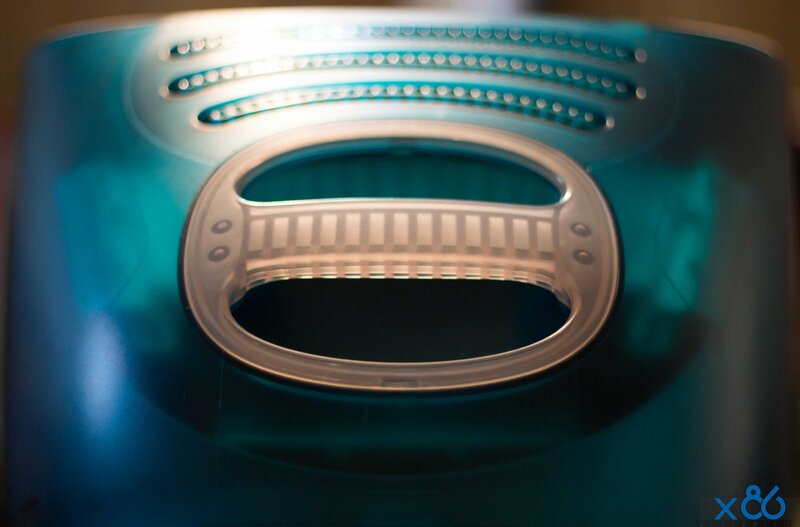 Its unique shape and color options helped ingrain itself into late 1990s pop culture. The iMac was the first computer to exclusively offer USB ports as standard, including as the connector for its new keyboard and mouse, thus abandoning previous Macintosh peripheral connections, such as the ADB, SCSI and GeoPort serial ports. A further radical step was to abandon the 3½-inch floppy disk drive which had been present in every Macintosh since the first in 1984. Apple argued that recordable CDs, the Internet, and office networks were quickly making diskettes obsolete, however, Apple’s omission generated controversy. At the time of iMac’s introduction, third-party manufacturers offered external USB floppy disk drives, often in translucent plastic to match the iMac’s enclosure. Apple had initially announced the internal modem in the iMac would operate at only 33.6 kbit/s rather than the new 56 kbit/s speed, but was forced by consumer pressure to adopt the faster standard. The keyboard and mouse were redesigned for the iMac with translucent plastics and a Bondi Blue trim. The Apple USB Keyboard was smaller than Apple’s previous keyboards, with white characters on black keys, both features that attracted debate. The Apple USB Mouse was mechanical, of a round, “hockey puck” design which was derided as being unnecessarily difficult for users with larger hands. Apple continued shipping the round mouse, adding a divot to the button in later versions so that users could distinguish proper orientation by feel. Eventually, a new capsule-shaped optical mouse, known as the Apple Mouse (formerly “Apple Pro Mouse”), replaced the round mouse across all of Apple’s hardware offerings.